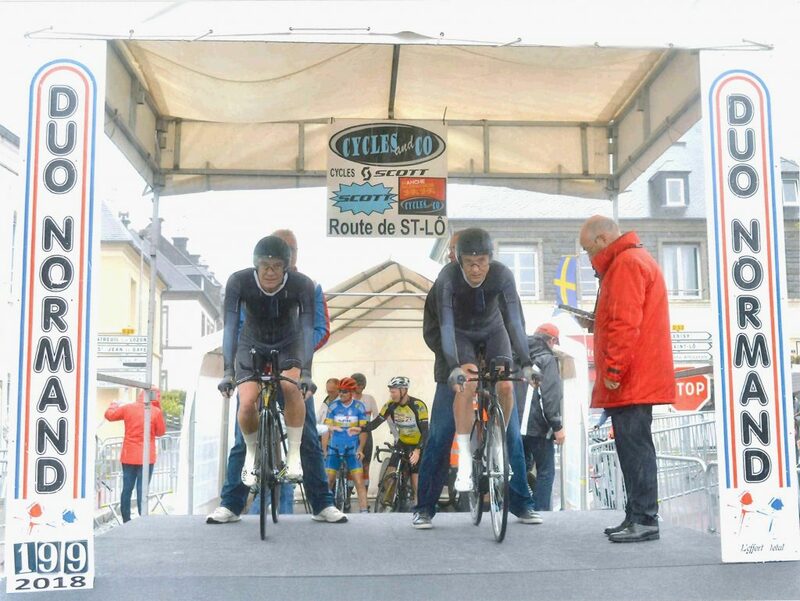 We approached the 2018 Duo Normand with considerable interest, as there would be a new course used. Grumpy Bob had visited the course on a low intensity tandem trundle round at the end of August. But riding it on the TT bikes would offer a better idea of how the course might play out. As per usual, as soon as weather forecasts became available on XC weather, we started looking ahead to 23rd September to get some kind of idea of what the conditions would be on the day, bearing in mid the lack of accuracy of longer term weather forecasts. It was with mounting horror that we saw the predictions for strong winds. By the 17th September, we were looking at 28mph wind with 48mph gusts. If this wasn’t bad enough, by the 19th (our day of departure for Normandy), this had worsened to 30mph wind with 56mph gusts. It was with some considerable trepidation that we set out for Normandy. After an uneventful drive to Portsmouth, we boarded the 10pm overnight ferry for Caen and crashed out for what was really a rather disturbed night’s sleep. Weather forecast on the afternoon of departure. Yikes!!! 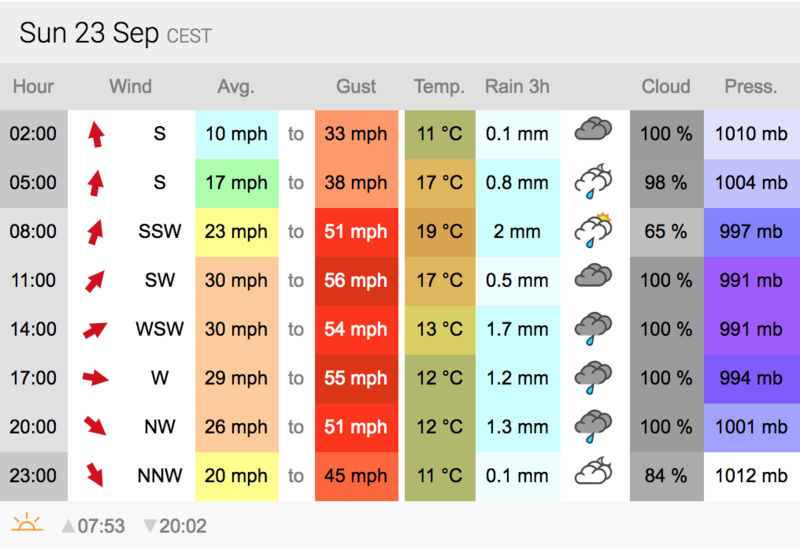 On arrival at our accommodation, we checked out the latest forecast for Sunday, and with some relief saw that it now predicted 17mph wind with 36mph gusts – definitely the forecasts were heading in the right direction! With similar conditions on the 20th, Team Grumpy set out to ride the course. The general opinion was that it was going to be a bit tougher than the old course, with some significant climbs bookending it. And we found riding the course with our H3 trispokes somewhat alarming at times – a really white-knuckle ride. Should we decide to use our backup wheels (road wheel for me, and Xentis for G) on the day? Of course, we neglected to note down the conditions, but Garmin Connect records it as 19mph winds from the southwest. Owing to lack of time before other commitments, we postponed test rides with the alternative wheels until the following day, and decamped to the local supermarket for some supplies, before returning back to the house and then on to a dinner appointment. In practice, that spacer is needed to hold the cassette tightly enough for indexing to work properly, so we had a clattery ride. Back at the homestead, the cassette was quickly reinstalled. We had a last ride round on the bikes, mostly to check Gerry’s indexing, cleaned up the bikes and had a spot of lunch. After this, we drove over to Marigny in the rain to sign on. The usual village kids selling programmes were conspicuous by their absence, maybe the rain had put them off! So decided to drive round the course. The rain seemed to have put off those who’d normally be checking the course out. Then it was over to Marigny to sign on and buy some more supplies. Later than afternoon, before we loaded the car, Gerry took it upon himself to change the battery of his Stages power meter, in direct contravention of Team Grumpy rules…this generated some stress, as at first the power meter wouldn’t cooperate with his Garmin Edge 520. Eventually we got this to work properly, so at least that crisis passed. We had a minimal Leffe consumption, with a relatively plain spaghetti with a pesto sauce, in our regular pre-race fuelling strategy. Neither of us slept well, which wasn’t really a good sign. We had decided to head over quite early enough to see the first riders start and to gauge the start and finish arrangements. It was already pretty windy and rather blustery. By the time we got changed into our skinsuits and readied our bikes for what passed as a warmup, a strong drizzle had begun, and by the time we were out warming up it had turned into a pretty steady rain. Maybe we were slightly apprehensive, but we got to the riders’ holding area too early and found ourselves queueing at the start ramp for about 10 minutes. Fortunately one of the officials let us stand inside the small tented area, which at least gave us some protection from the elements. On the start ramp, I felt pretty uncertain – I was being held up at something of an angle from vertical (this isn’t usually an issue at the Duo Normand) and this, coupled with the fact that the already steep start ramp was located on a downhill section of road made the entire start process look rather precipitous. At least we were sheltered from the rain which was now quite heavy. The photographer was swathed in plastic! Feeling very apprehensive at this point! As you might expect from a downhill start line, the opening few hundred metres is pretty quick. Until, at least, you reach the sequence of climbs in the first five miles or so. In preparation for this, I’d changed my 39 tooth chainring for a 44, as I felt that 39 was a little too low. In practice I just left it in the 53 ring and had no real trouble. Gerry, on the other hand had the breathing issue that often affects him, and we did have to ease back a bit on the climb to Montcuit. Once over the top, we were on a ferociously quick and twisting descent. In our inspection of the course, this had given some cause for concern, but on the day, it was fine, despite the rain and blustery conditions. Unfortunately, my visor was collecting loads of much from the rain and spray, and realising that I was having difficulty distinguishing marshals from barriers, I chose to remove it. This meant that I was exposed to the full spray from Gerry’s back wheel. But that felt safer that riding blind! From Tribehou it was on the the new section of the course, which took us up towards Pont Hebert and alongside the new road. This was quite exposed and it felt as though that we’d made a wise decision to swap out the trispokes. At one quite sharp corner, we saw a mud-stained team clambering out of the ditch having clearly mis-judged the corner. From here, there’s a few relatively short climbs and descents before joining the final stretch of aroung 4km to the finish. This wasn’t without drama, as Gerry nearly over-cooked the final left hand turn! Then there’s a bit of a drag to the final mile or so where riders scorch down to the finish line. We finished in 1:25:06 for 7th place in the Corporatifs (and if we understand the results correctly, 52nd overall). So one place further down this year. Ah, the years pass! How do I feel we rode this year? I don’t think we rode a great 2-up, as out changes were pretty ragged and we didn’t take regular short spells at the front. In our defence, I think some of this was down to the novelty of the course and to the prevailing weather. Still, we didn’t do too badly. And as for the new course – I quite like it. It’s definitely challenging, though in losing the final hairpin section it’s safer than the last version. On the other hand, losing the passage through town and moving the finish further along the road (which offers a greater distance for riders to come to a stop) seemed to reduce the spectacle – which itself was dempened by the weather. 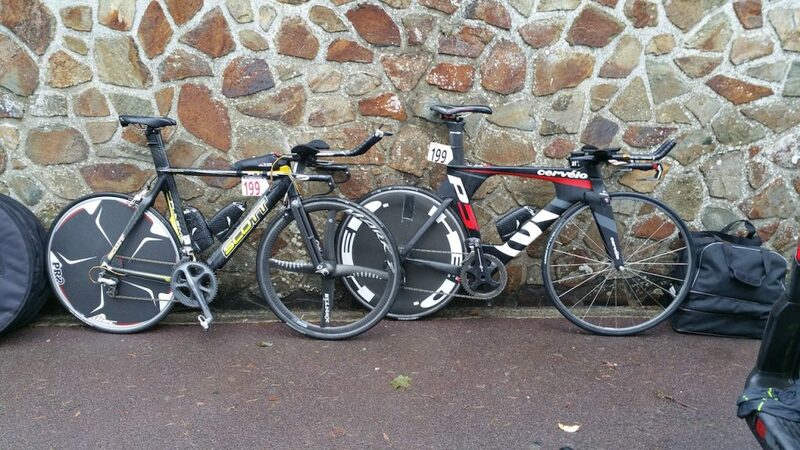 After returning to the car, we struggled out of sopping skinsuits and put the bikes back in the car. We wandered back into town and grabbed some food, ordered photos, failed to get the results. After a while, we decided that hanging about getting wetter wasn’t a good idea, so we buzzed off back to the accommodation and got cleaned up before eating, clearing up, packing and setting off for the overnight ferry from Caen.